Phew. Moved into the new apartment, had my first day at the new job, and now I need to tell you more about Upperville. 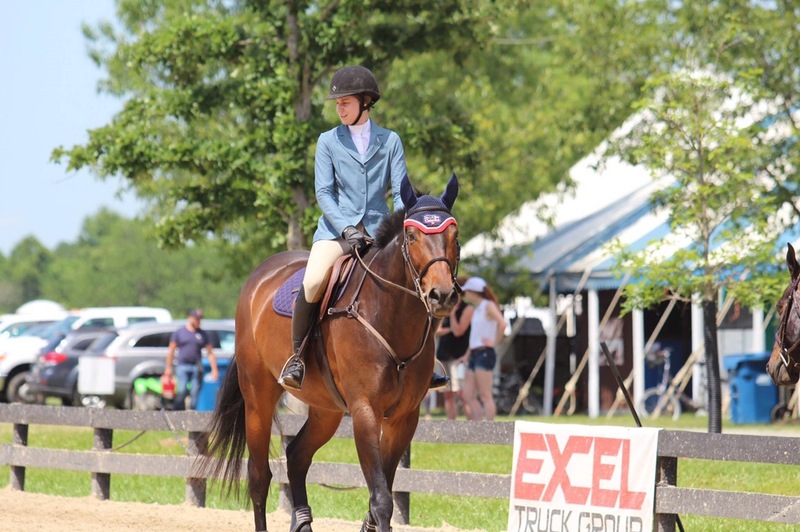 I had some pretty high hopes going into Upperville- not of the ribbon variety, but more just reeeeally wanting to go lay down some good rides in our division. I combined that drive for success with barely riding for two weeks prior to competing. Because that’s always how to get better at things, right? Completely wing it. Except you forget the part where Francis is literally a unicorn pegasus hearts and flowers kind of horse that is way better to me than I deserve. Srsly. Overall I was thrilled with our rounds- despite my lack of saddle time I think I made decent decisions and stuck to the plan, and Frankie was just so on top of things that he made up for any of my deficiencies. Too tired to close his mouth. But I left him to his beauty sleep and went to learn my course with my trainer. By the time we got back to get ready for warmup he had roused himself (luckily, I had a BEAST of a time getting him up at Culpeper) and we were able to go get our muscles moving. I liked this course a lot! We came up to jump 1 off a shorter turn on the right lead- we like to collect through the turn and then bounce up instead of taking a longer runway approach. And it paid off with this lovely effort. In love with those perfectly even back feet! We stumbled a bit off 2 but recovered in time for 3, and just continued on to 4. The bending into the combo walked a little short and I ended up holding a bit too much- it was uphill and away from the gate so it didn’t ride as short as I anticipated. But Francis was a bro and powered out the one stride totally fine. 6 to 7 was fine and all was clear, so we continued on to the speed phase. I let him get up on 8 too much and knocked a rail, and then we knocked one of the rails in the combo, got a bit of a flyer out over 11, and then 12 to 13 was decent. Did we make mistakes? Absolutely. Did my horse listen like a champ and give me what I asked for every step of the way? Also absolutely. His first time in the ring, tons of activity, and he stayed tuned in to me the whole time. 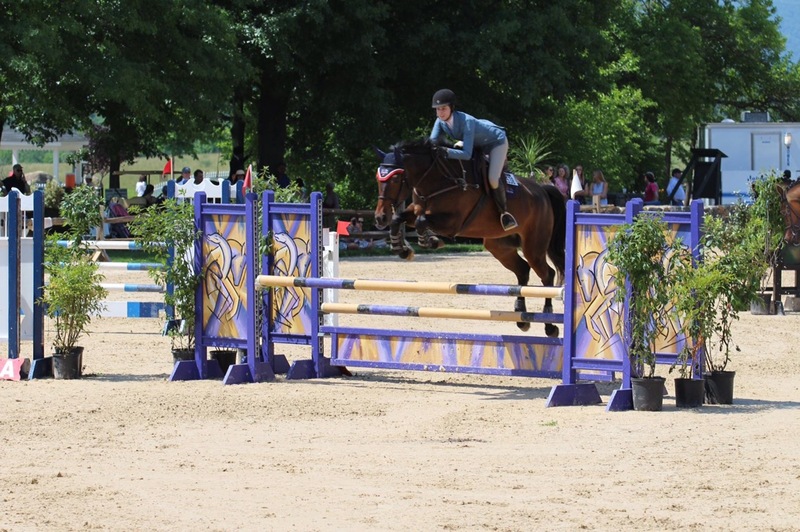 Even better- after going through the timers and finishing, he tried to veer left and pull me towards jump 3. He wanted to go jump more. While we were out of the ribbons, I finished in the top 50% of the class and with a happy horse who was loving his job. I consider that a definite show success! We also got to go cool down with these views, so not too shabby. Sunday was brutally hot. Like, it sucked. You know how when it’s that hot out you don’t want to eat because nothing is refreshing enough and your body is just too hot? Yeah. I did choke some fuel down, but I didn’t enjoy it at all. But Frankie continued his eternal streak of being a Very Good Boy. Including mugging for the camera while getting tacked up. While more challenging, I thought this was a really fair test. There were a few options for the bold to make some intense inside turns, the time allowed was tight, but it wasn’t trappy anywhere. If you rode a good pace and made efficient turns, you could safely ride this competitively. We again chose to make a short turn on the right lead to jump 1 (passing in front of jump 3). 2 to 3 was a standard 5 strides- I saw some horses struggle to get out in 5 if they didn’t jump in correctly, but I liked our jump 2 and Frankie carried his standard stride to take us out just a leeetle bit long. End jump at 4 was fine, 5 was ok- it was a skinny and a very upright vertical so a lot of horses knocked that one. We got a bit close on it, but Frankie was scrappy and got his feets out of the way. I needed to hold more left leg and get straighter into the combo, but we ended up to a good takeoff spot and made it through unscathed. We flew a bit into 7 which made 8 really tight- Frankie earned his oats by getting clear over that, because that was a tough spot for him. And then my horse started running out of steam. Due to scheduling confusion and the heat we had done a longer warmup than we strictly needed, and this was a long course. But true to self, he still went about his job like a pro and carried me through the triple combo without touching a rail. We galloped up 10-11 and took a well earned breather. Despite the heat and both of us starting to flag, we had gone clear and within time! They buzzed us for our jumpoff almost immediately. Again, 1 was fine. I didn’t get him back quickly enough to make the turn I wanted to 3, so we went a bit wide. 13 to 14 was a basic bending line, not much to say there. Then I am so proud of Frankie- we took a tighter turn and sliced across the oxer at 10 and he didn’t even blink. We made it around through the one-stride no problem again, and just has one jump left. Away from the gate. The course designers absolutely did this on purpose- both of us tired and hot and ready to be done, and I didn’t get his attention back on me and we biffed the last one. Womp womp. Just goes to show- do not relax until you are through those last timers. But we again managed to finish in the top 50% of a big class, even if we were out of the ribbons. And we again finished with a horse that was tired, but a horse that had his ears up and made his way back to the barn with a spring in his step. And the height? Not even a thing. Frankie charged fearlessly ahead to every jump on course. So yeah. 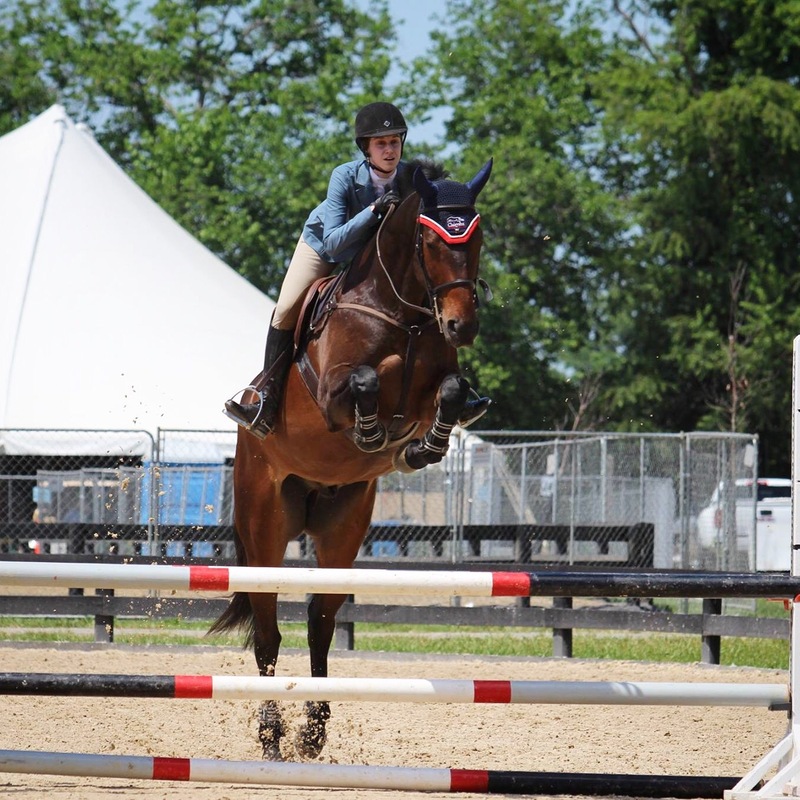 My goal of going to Upperville and having some good rides was 100% successful in my book. Nowhere near perfect, but we’re further along that path than we used to be. And if you didn’t have a crush on Frankie before this, I hope you do now because he deserves all the love in the world from everyone. I count my lucky stars every day to have this goofy wonderful gelding in my life. We now have our sights set on Zones in August! Our new outdoor is complete (post to come once I get pics I’m satisfied with) and full of fun jumps for us to practice with, and Frankie has never felt better. 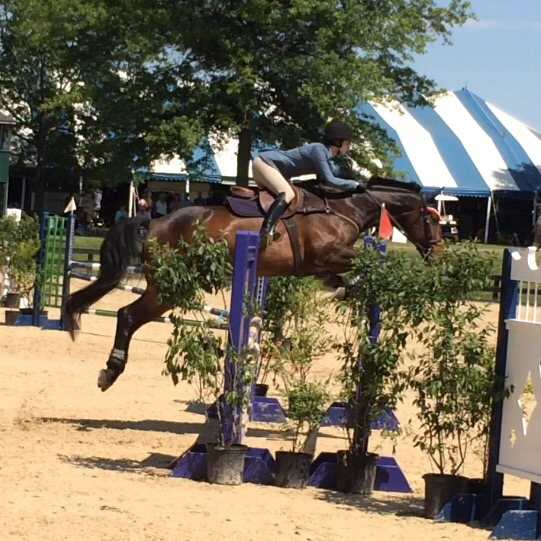 It’s looking like we’ll do that in August, and then wrap up our season at Culpeper Finals end of September- we’ll plan to do the Modified A/O division at 1.15m, and I’m going to beg and plead and work really hard to convince my trainer that we should probably try a 1.20m class. We’ll revisit as we get closer depending on Frankie’s fitness, my own fitness, and how our training is going, but that’s a tentative stretch goal. We’ll focus on smoothing out the rough edges at 1.15m first, I GUESS. Hope to get some more updates out to you soon! I’m in the midst of a move right now (technically homeless for a few days, but a barn friend is graciously putting a roof over my head and feeding me wine, so it’s all good) meaning I don’t have access to my computer for a bit- I’m writing this on my phone right now. But my Upperville recap will be the first thing on the docket when I once again have a keyboard, never fear. Spoiler alert: it was AMAZING. No ribbons in a super competitive division of about 35 horses, but rounds that felt good, that I’m proud of. Frankie was the best he’s ever been (which is saying something, we all know he’s always great) and was absolutely worth his weight in gold. Sailed through our first 1.15m like it was nothing even with my ammy mistakes, and tried to pull me to jumps even when our courses were over. I know you’re all probably getting sick of reading this, but wow. This horse is so far beyond anything I could’ve hoped for in a million years, and I am so grateful to get the chance to go out and have fun with him. I may be biased, but pretty sure I have the best horse in the world. Love my Francis!!! Ok I got a bit carried away, but here are a few pics to tide you over until I can put a real post together. Mother ran you past a distance to a 1.10m oxer? No problem for a FrancisBeast! 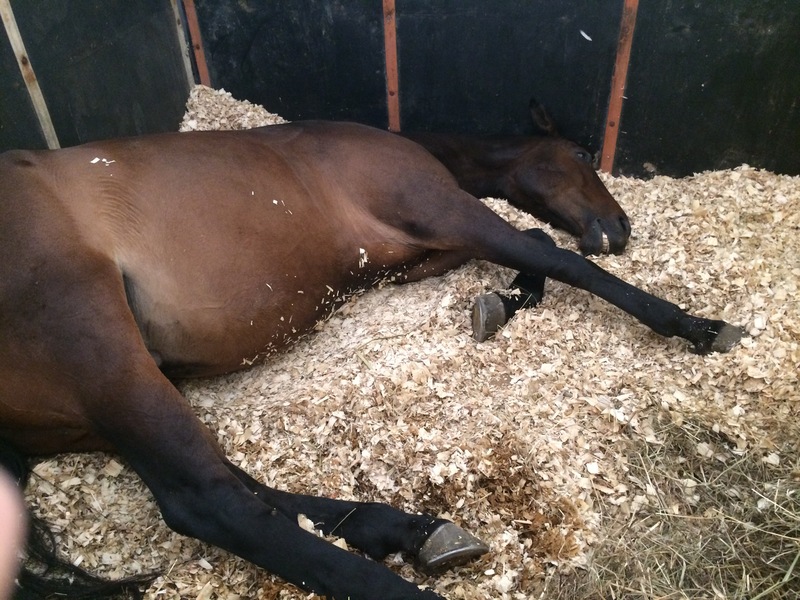 The traditional horse show nap. At least he knows how to relax. This is the same horse that used to hang his legs and heave over a jump. Doesn’t look like the same horse, but it is. Thank you so much Abby, Glendon, Manfriend, Manfriend’s Momma, and everyone else who snapped some great pics this weekend! Can’t wait to share more details with y’all.